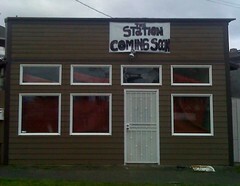 This coffee-colored building near El Centro is about to become a coffee shop, "The Station." Photo by Joel Lee in the Beacon Hill Blog photo pool on Flickr. The Seattle Weekly‘s food blog, Voracious, reviewed one of our favorite hidden food gems on Beacon Hill: the Beacon Avenue Shell Station. Yes, a gas station. The reviewer got a disappointingly old filet of catfish, but we know that if you get there at the right time the stuff is dee-lish. Michael Wallenfels of Mokusai Design is teaching a Cartoon Drawing class at Jefferson Community Center this spring, on Thursday nights from April 8 to June 10. For more about this and some other classes, see the flyer. We wrote a couple of weeks ago about Spanish language classes for adults at El Centro de la Raza. Elliott from El Centro wrote to tell the Beacon Hill mailing list that there are now two classes, so there should be enough room for everyone who wants to learn. The Beginner (Plus) classes begin Monday, April 5, and will continue on Mondays and Wednesdays from 6:00 pm to 7:30 pm until June 9. The class fee is $300, which goes to support the programs at El Centro. If you have questions or want to enroll, call Enrique Gonzalez at (206) 957-4605 or email execasst@elcentrodelaraza.org. Registration deadline is March 31. We are told that on March 10 20, the PLOP! Cabaret Performance Series will come to “an intimate house setting” somewhere on Beacon Hill, featuring poets Kate Lebo, A. K. “Mimi” Allin, and Jennifer Borges Foster. More info here. Jordan of Communichi, the acupuncture clinic located in the El Centro building, just returned from Haiti where he volunteered in the relief effort. He wrote about his experience in the Communichi blog. Sound interesting? Email the poster at comm-3mdsy-1627068912@craigslist.org. Go to the Amazon WebStore Beta Invitation page. Look at the image in the lower right, featuring a retailer named “BH”. According to Techflash, “BH” stands for Beacon Hill; it’s a fake retailer that Amazon uses when they want to show off their new features without using a real company’s name. Amazon may be leaving the Hill soon, but perhaps they will keep a little bit of Beacon Hill with them for a while. The Filipino Community Center in the Rainier Valley is hosting a Community Forum on the 2010 Census on Thursday, March 11 at 6:00 pm. The forum will offer people the opportunity to ask questions and review the census forms. The Filipino Community Center is located at 5740 Martin Luther King Jr. Way South.